Connor Garry, Julie Boyle and Erica Dixon competed in the West Leinster Schools competition held in Santry. Connor was outside the medals in his shot putt, but he was happy with his performance. Julie competed in the short hurdles and won her race with ease. Julie is a student at Colaiste Chiarain. Erica was throwing Javelin and won her event, Erica is a student in St Wolstans. Well done and best wishes for the Leinster Schools. 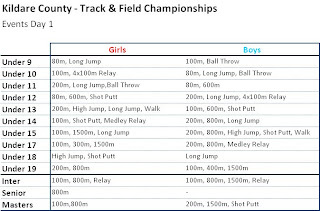 This year's county Track & Field championships start with Day 1 in Celbridge AC on the 10th May at 12:00. The following are the events that will be held on Day 1. Now in its 8 year of running, the Leixlip 5k road race has been given a make-over with an improved and faster route. The race will now start outside the Leixlip Amenities Centre and finish with a lap of the grass 400m running track behind the centre. This event is truly a race for all abilities as evidenced by last year’s results where Eric Keogh (Donore Harriers) won the men’s race and his mother brought home the field a little while later. The race which starts at 11am is an AAI approved, certified 5k route and is being hosted by Le Chéile Athletic Club. Online registration is available on runireland.com (€10 for runners and €5 for walkers) until Wednesday 6th May. Registration will also be possible on the morning of the race with an entry fee of €12 for runners and €6 for walkers. Goto www.lecheileac.com or contact Tony Brennan on 086 7855905. Round 1 of the Kildare league will take place this Saturday in Kilcock at 3pm. Warm-up and registration will take place from 2pm. Entry is €2 per athlete payable on the day. The age category is determined by the athlete's age next birthday, based on the age they will be during this calendar year. For example: If an athlete turns 8 at any time this year, they will compete Under 9 for all competitions during 2009. Just a reminder that there will be no training tonight (9th), Sunday (12th) and Tuesday (14th). Training resumes as normal next Thursday (16th) from 6.45-8.15pm.